An engine squeal, screeching or squeaking noise is usually one of the few things that can be wrong. Within these noises are a few scenarios when these sounds present themselves; constant, intermitted, when the engine is cold or hot. Sounds of this nature are usually caused by a roller bearing going bad on one of the engine accessories such as an alternator, water pump or idler bearing. The serpentine belt can be showing signs of wear as well or a worn out tensioner that is not supplying adequate pressure to the belt. Both of these noises can come and go and occur at different times while driving. As drive belt components age they are subject to many hot and cold cycles which causes the material such as the rubber on the serpentine belt to wear and glaze over which causes the belt to lose traction. This traction loss it followed by a vibration which causes the squealing noise which usually occurs on engine start up or when accelerating. A popular cause of an engine squealing noise is a worn serpentine belt which if you took your car into a garage to have the repair done it will cost about $135.00 parts and labor. Most high quality replacement belts you can get from Amazon for about $22.00 (US). 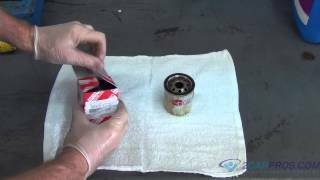 If the tensioner or an accessory fails the price will vary depending on the particulars of the repair. For example: if the tenesioner pulley bearing goes out and starts screeching the part will cost about $50.00 while and alternator can cost up to $250.00 so you must determine what is making the noise before the repair can be made. The serpentine belt is designed to drive the accessories such as the alternator, air conditioner compressor and water pump on most engines. When this belt starts to wear it produces a squealing noise at engine start up and under engine acceleration. This noise will continue for a short time and then stop as the belt heats up and starts to grab (much like the tires of a drag car). If the noise remains the belt must be extremely loose. With the engine off take a flashlight and inspect the condition of the belt while looking for missing ribs and pieces of rubber. Also, see if the ribs have a shine on them letting you know the belt is glazed and needs to be replaced which is most cases can be done in 30 minutes or less. Most belts should be changed every 45,000 miles or so. 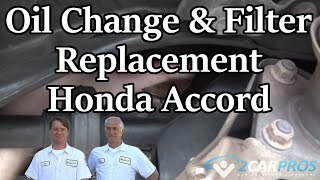 Check our YouTube Channel for all of our serpentine belt replacement videos. The serpentine belt tensioner is used to keep a certain amount of pressure on the belt so it can gain traction on the drive and accessory pulleys. When this belt fails it can do so in two ways the first is the spring built inside the tensioner will break weakening the effect of the unit. This lack of pressure will cause a screeching noise produced by the belt. The second way the tensioner can go bad is the pivot will wear out causing the belt to ride "off center" not allow the full width of the belt contact the pulleys therefore loosing traction and causing slippage. Using a flashlight check the alignment of the belt as it pertains to the pulleys also check the tension of the belt by pushing downward on an open span. It should give a fair amount of resistance to the pressure and if not the tensioner has gone bad and needs replacement to correct the problem. The belt idler pulley is designed to add support and provide a defection in the belt's routing while being mapped around the engine accessories. This simple pulley can be smooth or have groves depending on the side of the belt it is on. This pulley deals with engine vibration directly which can cause the bearing to fail producing a squeaking noise that follows engine speed. 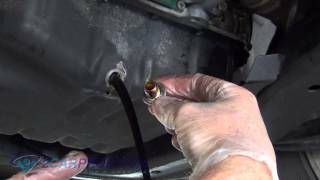 To check the idler pulley bearing remove the serpentine belt and spin the pulley by hand while listening for a bearing squeak or squeal letting you know the idler pulley bearing has gone bad and needs to be replaced to fix the problem. The additional items mounted on and driven by the engine have bearings that are used to support rotating shafts inside the water pump, power steering pump and air conditioner compressor. 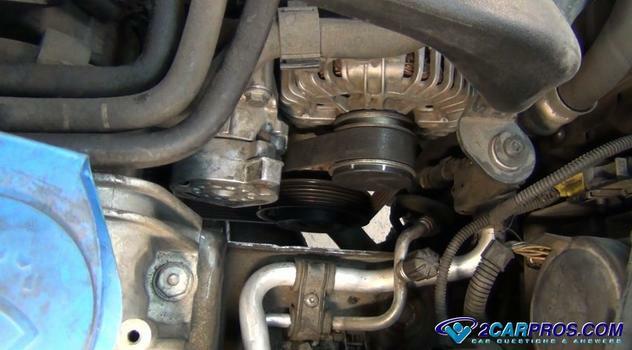 While the serpentine belt is off while you're checking the idler pulley check the rotational sound of the these additional sources of a squealing or squeaking sound. Alternators are prone to this kind of failure due to the additional rotational speed of a smaller pulley the unit's bearing can heat up causing the bearing failure. If you have any engine squeal questions please visit our forum. If you need car repair advice, please ask our community of mechanics is happy to help you and it is always 100% free.